by the Aikikai Foundation — Aikido World Headquarters in Japan. Come by the dojo and see one of our classes in action. No appointment necessary, you can just drop in. We encourage you to ask our instructors questions before or after class only. If you’d like to join our family, signing up only takes a few minutes. Our dojo is a tight-knit community where you can harness your personal power through intense physical training, pursued as a spiritual path towards your self-improvement. Aikido is a modern Japanese martial art that practitioners can use to defend themselves while also protecting their attacker from injury. Iaido drawing, cutting and re-sheathing the sword. This movement has so many layers and is so precise that it can take a lifetime to perfect. Children are taught the principles of respect, self-discipline, and care in an atmosphere that cultivates the mind and the body. 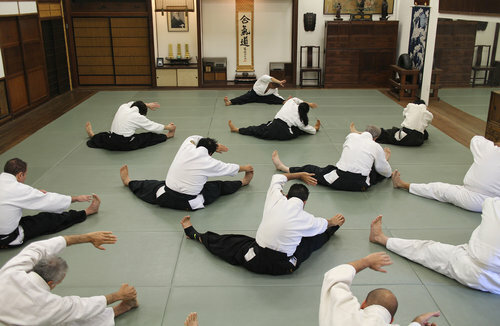 An effective Japanese martial art based upon centeredness which balances technical proficiency with spiritual discipline so that the practitioner can utilize their opponent’s power and redirect that energy with just enough force into a throw, joint lock or pin which will result in the least amount of pain or injury to the aggressor. A community where a person goes to find and learn how to harness their personal power through intense physical training which is pursued as a spiritual path towards self-improvement. An old school not-for-profit traditional dojo which offers open and willing students the opportunity to forge themselves with the Japanese arts of Aikido and Iaido in an understandably strict but supportive learning environment.